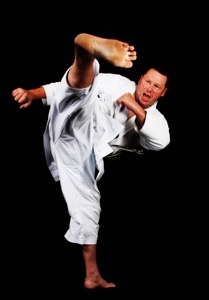 Sensei Oliver’s early martial arts experiences began in the late 70’s with Jiu- Jitsu and Wado-Ryu karate. Moving to South Africa in 1980, his training began in earnest with Sensei Stan Schmitt (JKA) and more so with Sensei Chris Anthony (SKI). As well as the general training, much of the supplementary training was done outdoors with weekend gasshukus, long runs etc. This was an exciting start to a karate career. Returning to the UK, Terry continued training at Enoeda Sensei’s dojo before settling in Portsmouth. “I watched a fantastic demonstration with the Japanese Navy and Portsmouth Karate club, which led me to the door of Sensei Mick Dewey”. Terry’s training has been fostered and developed by many years being part of Sensei Dewey’s Portsmouth dojo and more recently at Lovedean KC with Sensei Brian Smith. With Portsmouth he enjoyed considerable competition success, being part of the strong SEKU squad and Portsmouth teams of the time. Terry captained both teams and relished being the ‘first man out’. Several times SEKU kumite champion being notable titles. Instructing became the natural progression and teaching at ‘the Honbu’ for Sensei Dewey was always a daunting task but an excellent starting point. Terry was the instructor at Winchester College for many years and more recently established Chichester Shotokan Karate Club. Throughout his career as an International referee Sensei Terry Oliver has officiated at world and European championships and various other national and international events. He has been the SEKU Squad Manager since 2008.